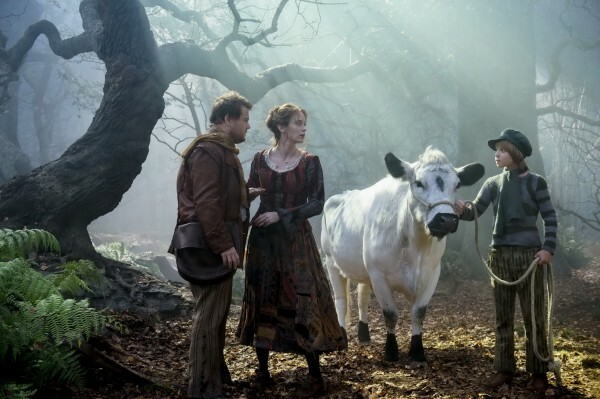 After several attempts to bring Steven Sondheim’s Tony award-winning Broadway musical “Into the Woods” from stage to screen, Hollywood has finally found a way to make it happen thanks to Walt Disney Pictures. Those familiar with the production, which has been around since 1987, know of its darkly comic take on classic fairy tale characters and may approach the film with skepticism, knowing the studio’s goal will be to cater to a wide audience (preferably family-friendly). With award-winning director Rob Marshall at the helm, known for his experience with musicals, “Chicago” (a hit) and “Nine” (a miss), fans might have thought that Sondheim’s work was in good hands. Determining whether or not the film succeeds may depend on how familiar you are with the source material or if you’re venturing “Into the Woods” for the first time. Having never seen a stage production of “Into the Woods”, I came to this big-screen adaptation with no preconceptions influencing my viewing. That may have been to my benefit. Considering the many songs that have been omitted and how one key character has been amalgamated here, this may be to my advantage. I’ve been told though, that there’s certain things I just “won’t get” due to my lack of knowledge, which I don’t like to hear. A movie should not require viewers to be well-versed in its original source (be it book, play or musical), it should simply stand on its own. There’s nothing I should have to “get”. 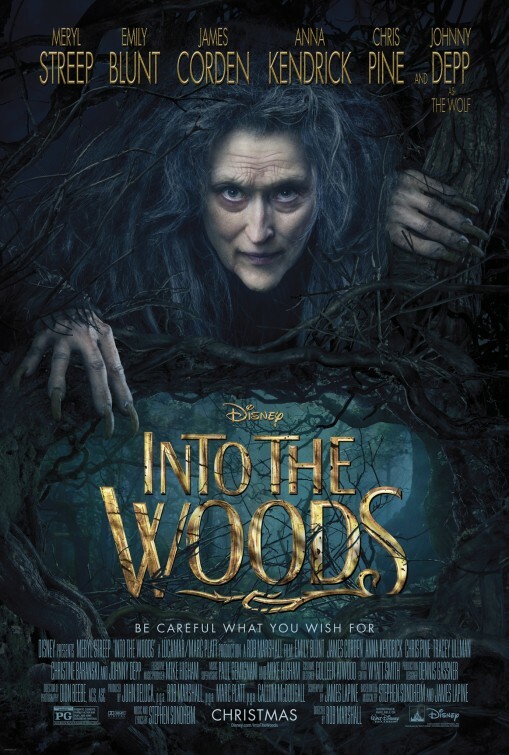 The movie’s infectious opening number “Into The Woods” is a brisk introduction to who we’ll be following and how they’ll obviously converge in the titular woods. Little Red Riding Hood (Lilla Crawford) is making her way back to her grandmother’s (Annette Crosbie) house in the woods, but first she has to feed her sweet tooth with a stop at the local bakery. It’s run by The Baker (James Corden, who also narrates) and The Baker’s Wife (Emily Blunt), who are happily married yet struggling to have a child of their own. Cinderella (Anna Kendrick) is all but ignored by her stepmother (Christine Baranski) and two step-sisters, Florinda (Tammy Blanchard) and Lucinda (Lucy Punch), as she serves them to no end. She wants to attend the three-day festival the Prince (Chris Pine) is throwing and seeks assistance from the spirit of her mother (Joanna Riding) in the woods. Young Jack (Daniel Huttlestone) lives with his overwhelmed mother (Tracey Ullman) must leave their rundown barn and travel through the woods to sell his beloved white cow in town, in order for them to make ends meet. Each have their own reasons for going into the woods where they will undoubtedly cross paths. But the story really kicks off though when The Baker’s neighbor, The Witch (Meryl Streep), blows into his home, startling him and his wife, not only with her entrance but also with her secret. She tells them of a curse she placed upon The Baker’s family before he was born, all because his father (Simon Russell Beale) would sneak into her garden to steal greens for his craving pregnant wife and, inadvertently, some magic beans. In recourse, The Witch cast a spell that would render The Baker’s family tree barren, which is why The Baker’s Wife has been unable to get pregnant. She also took The Baker’s twin sister at birth and hid her in a tower in the heart of the woods. If you know your fables, you’ve already guessed that girl would grow to have some extremely long blonde hair and go by Rapunzel (Mackenzie Mauzy). With the shock of this news, the nasty Witch offers a way to lift the curse. They must scavenge the following: a cow as white as milk, hair as yellow as corn, a red cape and a golden slipper – but they only have three nights to complete their task! From there, a good hour or so is spent on a search for these for items, in the woods, of course, while interweaving the developing sing-song stories of each character. 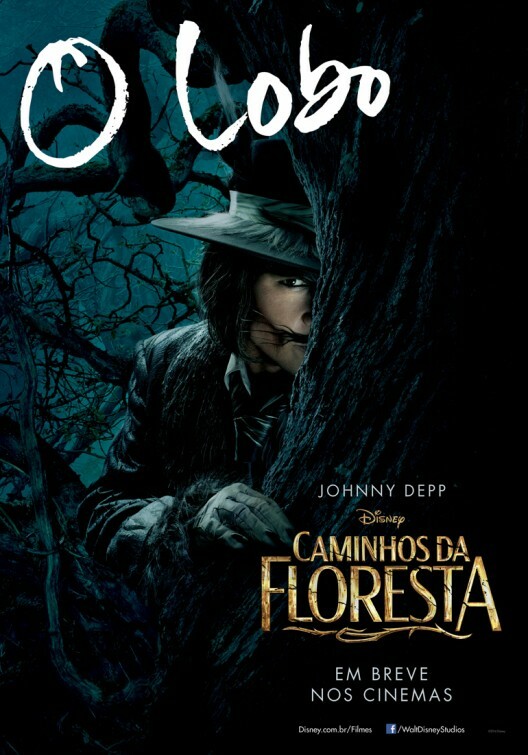 We follow Red Riding Hood and watch as she bumps into The Wolf (a thankfully brief Johnny Depp), who slinks around the woods in a zoot suit. Jack adds mayhem to the woods when he climbs up the inevitable beanstalk. Cinderella has her own angst about hooking up with her prince and we find out that The Prince’s brother (Billy Magnussen) has a thing for Rapunzel. That leads into the musical’s best number, the amusing “Agony”, wherein the two Princes compete over which of the two is in greater agony over their respective unobtainable loves. At a waterfall in the woods, we see Pine indulge in Shatneresque overacting (which he must have been sitting on in the “Star Trek” movies) with his hilariously exaggerated mannerisms and cocky posturing. Watching the two of them attempt to outdo each others machismo, one could only imagine how hard it would’ve been to keep a straight face at the Shepperton Studios in London. Because we know the stories of most of these characters, what screenwriter James Lapine (the musical’s original librettist) focuses on is what happens in between those familiar beats – alternate takes, if you will. Along the way, themes such as revenge and retribution are touched upon, as well as infidelity, deception and fatal tragedies. Clearly not Disney fodder for all ages, but from what I’ve learned, the original macabre tone has been dialed down to fit the PG requirements. It makes little sense when you consider the original tales from the Brothers Grimm are quite dark, but the goal is to make the most amount of money and to do so a rating that will reach the broadest audience is needed. That’s why any injuries are short-lived and why most of the deaths are off-screen – because kids can accept unfaithfulness and maiming more than they can handle death, apparently. A great deal of attention is given to balancing mood and music in an engaging fashion, which in and of itself is a quiet a handful for Rob Marshall, who succeeds in such an endeavor for the first 80 minutes. Somewhere along the way, the mood shifts and the quality of the tunes falters. Still, the art direction and costume work by award-winner Colleen Atwood is impressive and spot-on, yet there are times when the lighting in the forest is too dim, making it quite a challenge to decipher what is going on. I also found myself noticing how the woods felt too much like stage sets as the film progressed. I wanted more of the giant gnarled trees seen throughout the movie and, come to think of it, I wanted to see the woods come to life more; become more magical, and maybe even a character all its own. I wanted a more cinematic feel that wouldn’t continue to remind me that this story originated on the stage. Unfortunately, that never convincingly occurs. As mentioned, Pine is a fun surprise here. He’s shown his comedic side before, most recently in “Horrible Bosses 2” but his unexpected crooning skills are great. James Corden is just fine as The Baker, although the character knows very little of nuance. But “Into the Woods” belongs to the women, particularly The Baker’s Wife, Cinderella and The With, all of whom are the most developed characters. Emily Blunt (who, with “Edge of Tomorrow” has had a fantastic year) is great here, conveying a convincing confusion and emotional struggle over the course of the story. Kendricks, proved her singing skills in “Pitch Perfect”, is a great choice and always a fine addition to any cast. Without much effort, she easily outshines those around her, except for Blunt. I especially liked her duet with Blunt in “A Very Nice Prince”, which shows her character’s uncertainty and indecision. And then there’s Streep – is she ever bad? Rarely ever. As The Witch, she is appropriately big when she has to be and her gnarled body language is just right. She too has proven she can sing in the past (the underrated “Mamma Mia”), but I guess I’ve gotten to the point where I’m not at all surprised when she delivers a great performance in a movie. Most memorable here though are her expressive reactions to circumstances that aren’t quite going the way The Witch would like. 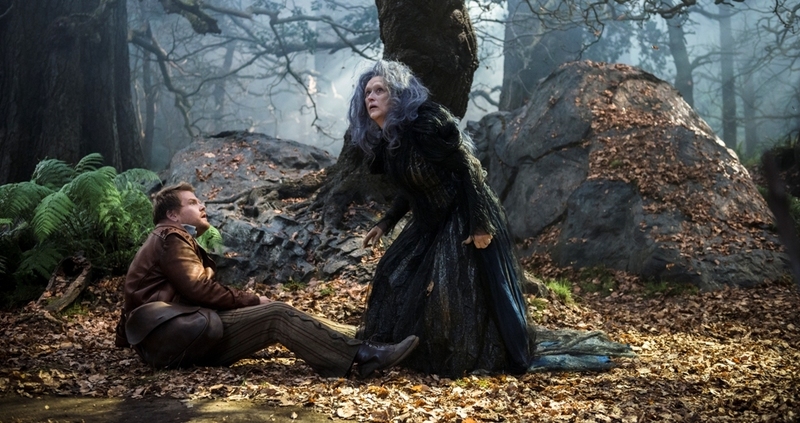 When “Into the Woods” takes a darker turn, I found myself losing interest in these characters. It felt like something even darker was missing. An off-screen death here and a forbidden meet-cute felt rushed and abrupt. It was here where I felt like the tone of the film was playing it safe, whereas it could’ve been something more disturbing. I can only assume there were Disney executives on hand with scissors as they met with Sondheim and Lapine. I’m betting I would appreciate a loyal stage production much more than Marshall’s Disney version. The music is definitely contagious and will likely warrant revisits, but I would rather discover the source than take a trip back to these woods. I did stop and think what it would’ve looked like with a more imaginative director, one who can manage the change in tones better – say Guillermo del Toro – imagine those. Ultimately, what petrifies these woods is the trimming the studio gives them in order to become a family-friendly escape during the holiday season.